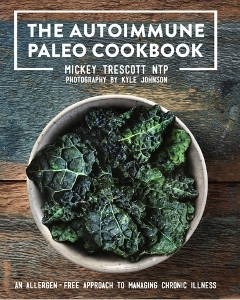 I’ve sung the praises of Mickey Trescott’s book, The Autoimmune Paleo Cookbook, numerous times before. Recently, Mickey released her expanded digital cookbook as a beautiful hard back book, available on Amazon here. 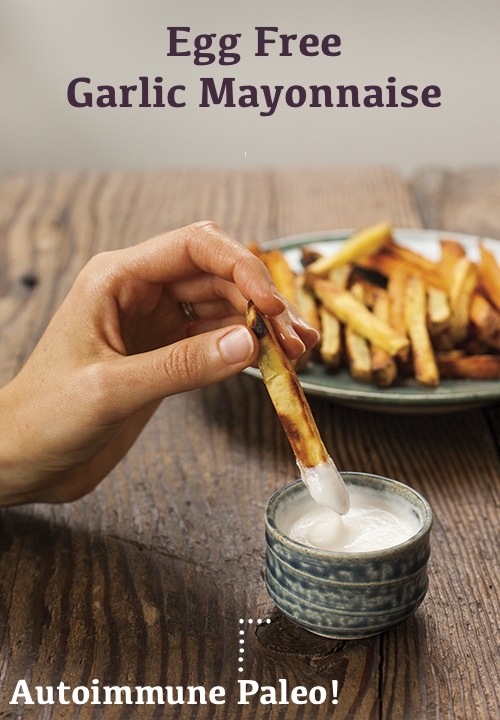 To celebrate the book launch, I’m sharing her recipe for Egg Free Mayonnaise from her book. 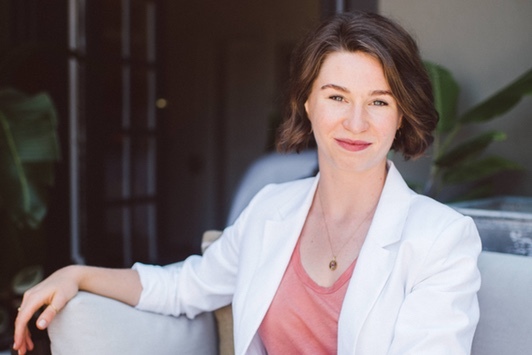 The Autoimmune Paleo Protocol, shortened to Autoimmune Paleo or AIP, is also referred to as The Paleo Approach and is outlined in Sarah Ballentyne’s book The Paleo Approach. 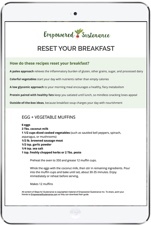 It’s a short-term, intensive healing diet designed to health the root cause of autoimmunity. 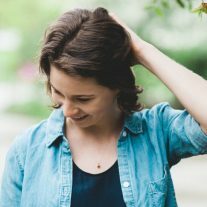 I’ve explained this healing protocol in detail before, first in an interview with Mickey Trescott here and just last week in a post called Getting Started with Autoimmune Paleo. 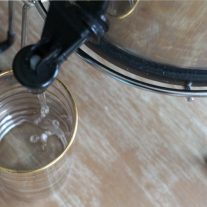 Creative cooking techniques replicate off-limits ingredients. For example, this egg free mayonnaise made with coconut! This is a multi-purpose condiment which I use as a dip for baked vegetable fries and grilled veggies. I also drizzle it over meats and seafood. Finally, I enjoy it as a creamy sauce for my zucchini noodles. It’s definitely a staple in my kitchen! Mickey uses the term ‘coconut concentrate’ in her cookbook, but this ingredient can also be found under the name of coconut butter or coconut manna. It is a creamy puree of coconut meat. It is not interchangeable with coconut oil, which is the pure oil. Think about the difference between almond butter and almond oil – the same difference pertains to coconut butter and coconut oil. Find coconut butter here to use in the recipe or make your own by pureeing coconut flakes in a food processor. Here’s a recipe for making coconut butter. Did you know the majority of olive oils imported from Italy don’t meet industry standards, meaning these oils are rancid or cut with cheaper oil such as canola oil? (Source) Producers frequently cut olive oil with cheap seeds oils, usually canola oil, and this additive remains undisclosed on the product label. In many cases, you’ll have better luck purchasing a good olive oil if it comes from California, not Italy. Many people suggest using the “fridge test” to see if your olive oil is pure. If the oil is pure, it should solidify in the fridge due to the monounsaturated fat content. 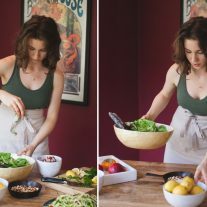 However, even pure olive oil may not solidify if it comes from low-wax olives like Mission olives according to author Jenny McGruther in The Nourished Kitchen. Refrigerating olive oil may also dampen the fruity flavor. I use this olive oil in my house because I know it is pure. There are many, many other options for pure olive oil, but this is the one I’ve researched and trust. Your best bet is sourcing olive oil from small producers whom you can contact directly to discuss their purity standards. Enjoy this egg free mayonnaise and don’t forget to check out The Autoimmune Paleo Cookbook! 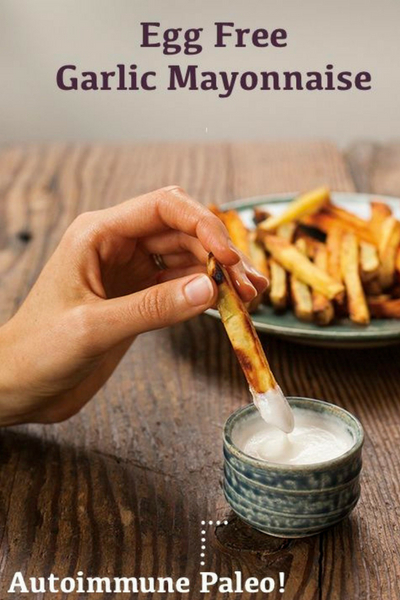 This egg free mayonnaise makes a tasty dipping sauce for homemade fries and grilled vegetables. I also like to whisk it with a little bit of apple cider vinegar use it as an autoimmune-paleo-friendly salad dressing. Mickey shares a recipe for coconut concentrate in her book, an ingredient used frequently in her recipes. It is interchangeable with coconut butter, which you can find here or learn how to make it by blending coconut flakes in a food processor here. ½ cup coconut butter (also called coconut manna or coconut concentrate), slightly warmed. Find coconut butter here or learn how to make it by blending coconut flakes in a food processor here. Place the coconut concentrate, warm water, olive oil, garlic cloves and salt in a blender and blend on high for a minute or two, until the sauce thickens. Let cool for an hour at room temperature – alternately, you can place it in the refrigerator for 20 minutes. If you would like to use the sauce in a cold dish, thin with water until the desired consistency is reached. This keeps well in the refrigerator, but it hardens. 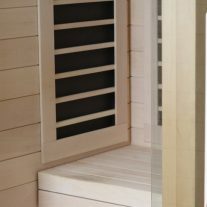 Let come to room-temperature or warm gently before using. Just made this. I think next time I will go with 2 cloves instead of 4. It is delicious! Thank you so much for the recipe! I’m sorry if this question was already asked, but how long do you think this would last in the fridge? I am also curious. Did you find out any information about how long it keeps? Should last a couple of weeks, but the garlic gets stronger during storage.